Dr. Fernando Trujillo is a second generation of ophthalmologist. He was born in Medellin, Colombia and later moved to San Antonio with his family to pursue his passion as an Ophthalmologist. He is a compassionate and caring physician striving to provide the best quality of care for his patients. His areas of expertise include refractive surgery (LASIK and PRK) and Corneal Transplantation. Dr. Trujillo received his M.D. in 1992 from Instituto De Ciencias de la Salud, Colombia. He completed an ophthalmology residency and refractive surgery fellowship at at Instituto Barraquer with Dr. Jose Barraquer the so-called “Father of Refractive Surgery” in Colombia before moving to San Antonio. He then completed an internal medicine internship and ophthalmology residency at the University of Texas Health Science Center at San Antonio. 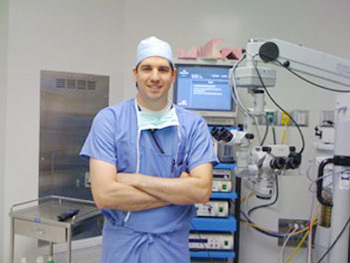 Along with clinical fellowships in corneal diseases and refractive surgery, he completed his training in 2004. Dr. Trujillo is certified by the American Board of Ophthalmology. He was an associate clinical professor at the University of Texas Health Science Center in the Department of Ophthalmology.